Close to the Belgium town of Modave, there is a large cave. It overlooks the Hoyoux River, a tributary of the Meuse and although no human bones have ever been found at this cave site, palaeoanthropologists are confident that it was once occupied by ancient humans as animal bones with stone tool cut marks are associated with the site. The cave is called Trou Al’Wesse (“Wasp Cave” in Walloon) and thanks to a remarkable application of technology, scientists now know that some fifty thousand years ago, a Neanderthal relieved himself inside the cave. That person’s urine and faeces may have long since decomposed but, left in the cave sediments were minute traces of his DNA. Researchers have shown that they can find and identify such genetic traces of ancient humans, enabling them to test for the presence of ancient hominins even at sites where no human bones have been discovered. In addition, the same technique can be used to map other mammalian fauna at these locations. The scientists, including researchers from the Max Planck Institute for Evolutionary Anthropology (Leipzig, Germany) propose that this technique could become a standard tool in palaeoarchaeology. Excavations at the site of El Sidrón, Spain. Human remains are extremely rare and although scientists are aware of the existence of ancient hominins such as the Denisovans, they are only known from a handful of fossilised bones (literally, a single finger bone and a possible femur, plus some teeth). However, cave soils and sediments themselves can provide genetic evidence in the form of tiny traces of ancient hominin DNA. By examining cave soils and sediments and extracting genetic traces, scientists can gain a better understanding of the evolutionary history of humans, even if no bones or stone tools are present. The research team members collected eighty-five sediment samples from seven caves in Europe and Russia that humans are known to have entered or even lived in during the Pleistocene Epoch. The samples dated from between 14,000 and 550,000 years ago. Using a refined DNA analysis technique, one that was originally designed to identify plant and animal DNA, the team were able to search specifically for hominin genetic evidence. Entrance to the archaeological site of Vindija Cave, Croatia. The picture above shows a view from the entrance of Vindija Cave in northern Croatia, one of the seven sites studied. Analysis of microscopic amounts of mitochondrial DNA at the Vindija Cave location confirmed the presence of several large mammals including Cave Bears at this location. 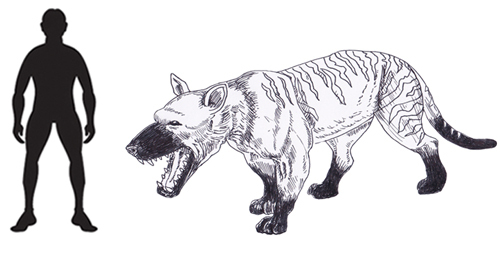 The researchers found evidence of a total of twelve different mammalian families across the sites that were included in this study, including enigmatic, extinct species such as Woolly Mammoth, Woolly Rhinoceros and Cave Hyena. DNA analysis helps map the presence of mammalian fauna in the absence of body fossils. Once animal DNA had been mapped the researchers turned their attention to identifying ancient human genetic traces within the samples. In total, nine samples from four cave sites contained enough ancient hominin DNA to permit further analysis. Of these, eight sediment samples contained Neanderthal mitochondrial DNA, either from one or multiple individuals, whilst one sample contained evidence of Denisovan DNA. The majority of these samples were taken from archaeological layers or sites where no Neanderthal bones or teeth had been previously found. Svante Pääbo, another co-author of the paper and director of the Evolutionary Genetics department at the Max Planck Institute for Evolutionary Anthropology commented that the ability to retrieve ancient hominin DNA from sediments represented a significant advance in palaeoanthropology and archaeology. The use of this technique could become a standard analytical procedure in future. A cave sediment sample is prepared for DNA testing. Even sediment samples that were stored at room temperature for years still yielded DNA. Analyses of these and of freshly-excavated sediment samples recovered from archaeological sites where no human remains are found will shed light on these sites’ former occupants and our joint genetic history. Everything Dinosaur acknowledges the contribution of the Max Planck Institute for Evolutionary Anthropology in the compilation of this article. Scientists for Hokkaido University and Hobetsu Museum have announced the discovery of the fossilised remains of a Late Cretaceous duck-billed dinosaur. In truth, a number of fragmentary fossils relating to a dinosaur had been found some years earlier, most notably caudal vertebrae (tail bones), before a more detailed and larger scale excavation was carried out to determine just how much of the dinosaur skeleton laid buried on a steep slope forming part of the large hills on the island of Hokkaido. 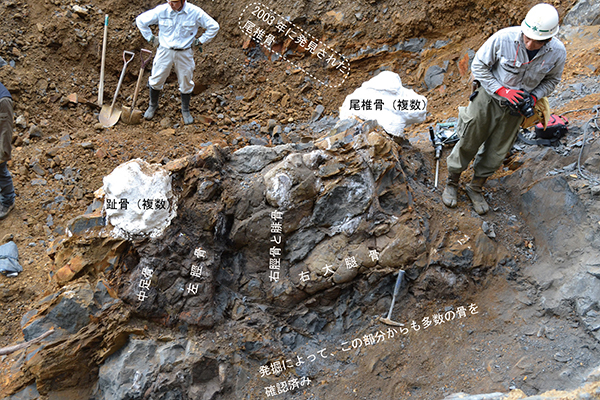 The outcrop on the steep slope where the fossilised remains of the duck-billed dinosaur were found on Hokkaido (Japan). The hadrosaurid bones were found in the marine deposits of the Upper Cretaceous Hakobuchi Formation. These sediments represent continental shelf strata, with a water depth of anything from 80 to 200 metres. Scientists are not sure how the terrestrial dinosaur came to be located in offshore rock sediments. Perhaps the dinosaur was washed out to sea and drowned or, the carcase of a dinosaur could have travelled out to sea with the gases inside its large gut keeping it afloat before the body cavity was ruptured and the corpse sank and settled on the seabed. Ammonites and other zonal fossils indicate that the rocks from which the dinosaur was excavated are approximately 72 million years old (Late Campanian to Early Maastrichtian faunal stage). A photograph showing a large rock nodule with fossil dinosaur bone positions marked. Japanese dinosaur discoveries are few and far between, with most of Japan’s dinosaurs having been described from a few, isolated fragments. Experts say it’s incredibly rare to unearth so many fossils and be able to piece back together almost the entire skeleton. Researchers from Hokkaido University and Hobetsu Museum are confident that these fossils will prove to be a new species of duck-billed dinosaur. The excavation and preparation work has taken a total of four years. Fortunately, the researchers had been posting regular updates on their progress to keep the inhabitants of the nearby town of Mukawa (on the southern coast of Hokkaido), fully informed and to deter any curious parties attempting to remove any of the partially excavated remains. Remains of a Late Cretaceous herbivorous dinosaur found in Japan. The fossils of this duck-billed dinosaur represent the largest and most complete dinosaur discovery from Japan. The picture above shows the scale of the dinosaur and the number of fossil bones discovered, laid out in approximate anatomical position. The articulated section of caudal vertebrae, one of the first fossil finds at the site, are shown on the far right of the photograph. An artist’s illustration of the duck-billed dinosaur carcase washed out to sea. The dinosaur has been nick-named the “Mukawa dragon” and it is hoped that an exhibit will soon be created telling the story of how this duck-billed dinosaur came to rest at the bottom of a shallow tropical sea and what its carcase can tell palaeontologists about life in the Late Cretaceous. Everything Dinosaur team members had the opportunity to examine the sculpt for the Schleich “First Giants” Dunkleosteus model and we commented at the time that we thought this would prove to be one of the most popular Schleich models to be introduced for quite a while. This has certainly turned out to be the case and now JurassicCollectables has given model fans the chance to get a good look at this Placoderm in their latest video review. This heavily armoured fish from the Late Devonian with its distinctive plates is one of the best known of all the prehistoric animals outside of the Dinosauria amongst model collectors. As a group the Placoderms (Class Placodermi), evolved in the Silurian and Dunkleosteus, is regarded by many as the first vertebrate super-predator in the fossil record. A number of species have been named and described, in the video the narrator states a length of six metres for this formidable marine monster, however, the lack of postcranial fossils precludes accurate measurements or even an assessment of the body plan of this prehistoric fish, but we at Everything Dinosaur have seen plates, (some of which are more than five centimetres think), that indicate individuals may have reached lengths in excess of nine metres. In the short, highly informative video, the remarkable dermal plates and jaws are seen in close-up view and the narrator comments on the silver finish that Schleich opted for and the battered, scratched and nicked appearance of the plates. This is very much how the plates would have appeared if you had braved diving in the Late Devonian and been unfortunate to meet one of these fearsome creatures. The JurassicCollectables video also pays close attention to the different types of scale depicted along the body. The viewer is given the opportunity to compare and contrast the different sizes of scale depicted on this skilfully crafted replica. Schleich Dunkleosteus model. The scales are highlighted in the video. JurassicCollectables have a wonderful YouTube channel which is full of dinosaur model reviews and other very informative and interesting videos. This YouTube channel has over 54,000 subscribers, that’s an amazing achievement, our congratulations to everyone at JurassicCollectables for such an amazing YouTube channel. Visit the YouTube channel of JurassicCollectables here: JurassicCollectables on YouTube , Everything Dinosaur recommends that prehistoric animal model fans subscribe to the JurassicCollectables YouTube channel. The YouTube channel of JurassicCollectables has got reviews of a number of Schleich replicas, including all of the 2016 Schleich “First Giants” releases. Scientists from the University of Alberta have been able to reunite the fossilised body of a Corythosaurus to its head, nearly one hundred years after the skull fossil was removed from the dig site. Researchers have matched the headless skeleton to a Corythosaurus skull (C. excavatus) from the university’s Palaeontology Museum that had been collected in 1920 by the eminent George Sternberg during field work in what is now called the Dinosaur Provincial Park (southern Alberta). The Corythosaurus skull collected by George Sternberg in 1920. The Corythosaurus skull shown in lateral view (above) was collected in 1920 and designated the holotype fossil for a new hadrosaurid (Corythosaurus excavatus) by C. W. Gilmore in 1923. The skull, (UALVP 13) became part of the University’s vertebrate fossil collection. In 1992, a previously uncovered, weathered, Corythosaurus skeleton was found. A field team from the University of Alberta collected the specimen in 2012 and research undertaken by Darren Tanke (a technician at the Royal Tyrrell Museum), a co-author of the paper indicated that the body remains could be associated with the already known skull material. In the 19th and early 20th Century, palaeontologists in North America were almost faced with an embarrassment of riches when it came to dinosaur fossils. The extensive fossil deposits in Utah, Montana and southern Alberta led to many field teams simply “cherry picking” and only collecting the most spectacular of fossils, items such as claws, skulls, dermal armour, horns and teeth. It is relatively common for a field team working in the Dinosaur Provincial Park to come across specimens missing skull material. A close-up of the head of Corythosaurus. In addition, an isolated Hadrosaur dentary (lower jaw bone), found in 1992, close to the articulated, postcranial skeleton may be one of the missing jaw fossils from the holotype skull. The idea that this postcranial material be the skeleton of the holotype of Corythosaurus excavatus was tested using anatomical information and statistical analyses. Statistical comparisons suggest that it is possible that the skull and dentary belong to the same individual. Furthermore, the researchers postulate that the postcranial material could belong to the UALVP 13 skull. This discovery highlights a growing field of study in palaeontology, wherein, scientists try to develop new ways of determining whether various parts of a skeleton, often located in different museum collections, belong to the same individual. For this paper, the team used anatomical measurements, but there are several other ways of matching up fossil bones, such as conducting a chemical analysis on the surrounding matrix to identify the rocks from which the fossils were found. An international team of researchers, including scientists from the Swedish Museum of Natural History, Stockholm University and the University of California, have identified microscopic structures found in tiny bubbles and pores in ancient basalt that resemble fungi. If these fungi-like structures are indeed Palaeoproterozoic remnants of members of the Kingdom Fungi, then this discovery could push back the date for the oldest fungi by between 1,000 and 2,000 million years. Views of treated micro-slides showing potential mycelium. Over the last few decades, cores drilled deep into the seabed and other exploration techniques utilised to build knowledge of the biota present in oceanic sediments and crustal rocks have revealed that many different types of fungi thrive in these environments. The fossil record of fungi is extremely intermittent and the identification of possible fungal remnants in the fossil record is controversial to say the least, (look up the Devonian Prototaxites for further details). However, many geologists and palaeontologists have proposed that the fossil record for such extremophiles does date back to at least the Early Devonian, a time when primitive plants and fungi were beginning to diversify and radiate in terrestrial environments. Drill cores taken from the Ongeluk Formation in South Africa show microscopic signs of filamentous fossils in vesicles and fractures. The filaments form mycelium-like structures growing from a basal film attached to the internal rock surfaces and they look very similar to the structures attributed to fungi found in rocks which are hundreds of millions of years younger. The Ongeluk fossils, are two to three times older than current age estimates of the Kingdom Fungi. Unless they represent an unknown branch of fungus-like organisms, which are new to science, the fossils imply that the fungal clade is considerably older than previously thought, and that fungal origin and early evolution may lie in the deep ocean rather than in terrestrial environments. The Ongeluk discovery suggests that life has inhabited deep sea oceanic rocks for more than 2.4 billion years. The jumbles of tangled threads, which are only a few microns across, if they are fungi, belong to the Eukaryote Domain (Eukarya), a diverse group containing at least four Phyla and some 6,000 species, (fungi include the familiar mushrooms and toadstools plus yeasts and moulds). Eukaryotes have cells that are complex with a distinct nucleus protected by a membrane. Animals and plants are also Eukaryotes and the discovery of such ancient life forms, preserved in ocean rocks has implications for the early history of the whole of the Eukarya, as well as potentially, pushing back the date for the evolution of the first fungi to around 2.4 billion-years-ago. The Professor added, that there was a clear possibility that these fossils represent the world’s oldest fossil fungi, much older than anything else known to the scientific community. A spokesperson from Everything Dinosaur commented that if these fossils represent fungi occupying gas bubbles in lava that form rocks in the seabed, it demonstrates how organisms can survive in extreme habitats. Tests have indicated that the rocks where the structures were found could have been as hot as 250 degrees Celsius and these lifeforms would have had to survive without sunlight and cope with immense pressure. If the fossil record for such fungi is extended by billions of years on our own planet, then it raises the intriguing possibility that such life forms may well have evolved and if they did, they probably still exist in extreme environments elsewhere in our solar system. The watery environment trapped under the ice of Saturn’s moon Enceladus could harbour the sort of conditions where organisms such as these could still thrive. Saturn’s Icy Moon Enceladus – Perhaps Home to Marine Crustal Fungi? A view of the moon Enceladus – could this icy world harbour fungi? Construction workers have unearthed five dinosaur eggs in the city of Foshan (Guangdong Province, south-eastern China). The eggs, preserved in red sandstone, were laid by a herbivore, but scientists are unable to identify the genera. The eggs are quite rounded in shape and measure approximately 13-14 centimetres in diameter. The strata dates from around 70 million years ago (Late Cretaceous) and the fossils have been taken to a local museum for safekeeping and further study. Plant-eating dinosaur fossil eggs from China. The discovery was made last Monday and video footage has been taken showing the construction site and the fossils that were found. Dinosaur eggs have been found in the Foshan area before, although to find a clutch is quite significant. Local palaeontologists are hopeful that these fossils will help to provide a clearer picture of what life was like in this part of China during the Maastrichtian faunal stage of the Late Cretaceous. The “Red Beds” of sandstone have produced a number of dinosaur fossils, including Theropods. At least three different types of dinosaur egg fossil have been described and in some parts of southern and south-eastern China, they act almost like index fossils helping to date the relative ages of sediments. A spokesperson from Everything Dinosaur commented that Titanosaurs are known to have lived in this part of China around 70 million years ago, but the eggs are too small to be ascribed to a type of Titanosaur with any confidence. The eggs may have come from a hadrosaurid. Today, April 23rd, is St George’s Day, the national day for England (St George is the patron saint of England, a saint incidentally celebrated and revered by a number of other countries too). The story about brave St George slaying a dragon might be a myth, but we thought just for fun we might try and list as many dinosaurs associated with dragons as we could. This is harder than it seems, for example, St George is honoured in both western and eastern cultures and in China, the origin of the dragon legends could have originated from the discovery of fossils of dinosaurs. Which dinosaurs? We don’t think anyone can be sure. Children draw the Uffington prehistoric chalk figure. The word “long” translated from the Chinese means “dragon” so we could have the Theropods Guanlong, Shaochilong, Zhenyuanlong, Dilong and Zuolong for starters. To this list, we could add the basal Ceratopsian Yinlong (Y. downsi) and we must not forget the beautiful “sleeping dragon” fossil, representing a troodontid, named as Mei long. The sleeping dragon Mei long. As well as those dinosaurs from Asia with names that reference dragons, there are a number of genera named after the Latin for dragon “draco”. How many can we name? Firstly, we have Dracoraptor hanigani, a very early Jurassic dinosaur from Wales, a country with its own dragon culture and stories. An illustration of the Theropod dinosaur from Wales Dracoraptor hanigani. In addition, we can add Pantydraco (P. caducus), a Late Triassic member of the Sauropodomorpha from the Vale of Glamorgan. What other dinosaur dragons can we think of? Dracovenator (D. regenti) – from the Early Jurassic of South Africa, believed to be a dilophosaurid. Draconyx (D. loureiroi) – from Portugal a possible iguanodontid. How many dragon inspired dinosaurs can you name? The recently introduced Schleich Brachiosaurus dinosaur model is proving to be a big hit amongst teachers and teaching assistants who work with Foundation Stage children and those children in Year 1. The model, which measures around thirty-two centimetres in length and stands a fraction under twenty centimetres high is an ideal size for little hands to handle and the dinosaur is sturdy enough to withstand the attentions of even the most enthusiastic, budding palaeontologist during creative play. The Schleich Brachiosaurus dinosaur model (2017). Children in Foundation Stage (Nursery and Reception) will be mostly learning through games and creative play activities, although in Reception classes (Foundation Stage 2), by the beginning of the summer term, many schools will be introducing more structured learning routines to help prepare the children for the greater emphasis on cognitive abilities which comes with Year 1. One of the key areas of learning is to help children to develop language and communication skills, as well as learning about the properties of materials (understanding the world). The Schleich Brachiosaurus model has a roughened texture over part of the dinosaur’s body. Other areas are smooth, as a result, the figure is ideal for exploring how different objects feel. The beautiful texture of the Schleich Brachiosaurus is ideal for creative play. Dinosaur toys and models are a source of fascination for both young boys and girls. Team members at Everything Dinosaur use an assortment of dinosaur models and figures in their outreach work with children, particularly those children in Year 1 and Foundation Stage. The tactile, kinaesthetic quality of the Schleich Brachiosaurus dinosaur makes it ideal, as the children feel the model’s rough scales and smooth skin. We also use this Schleich dinosaur model to help children learn and remember the names for different parts of the body and to compare our bodies to that of a dinosaur. Can You See His Eyes? How Many Eyes Does the Dinosaur Have? The tactile quality of a Schleich Brachiosaurus dinosaur model. The Schleich model is ideal for exploring parts of the body with young children at Foundation Stage and Year 1. Can they point to the teeth? Where’s the dinosaur’s tongue? Can you count the dinosaur’s toes? The Schleich Brachiosaurus dinosaur model has a very tactile nature, a result of the carefully moulded scales on various parts of the body. It is a robust and sturdy dinosaur model, ideal for use when working with EYFS (Early Years Foundation Stage).